Dubai: Prince Karim Aga Khan, the spiritual leader of the Shia Ismaili Muslim Community, arrived in Dubai on Monday on an official visit as part of his Diamond Jubilee commemoration. His Highness Shaikh Mohammad Bin Rashid Al Maktoum, Vice-President and Prime Minister of the UAE and Ruler of Dubai, received Aga Khan on Tuesday. Shaikh Mohammad and the Aga Khan discussed a number of topics related to charitable and humanitarian work, and ways to extend bridges of cooperation and coordination between the Aga Khan Foundation and humanitarian and charitable institutions in the UAE, which will activate humanitarian and development works carried out in needy countries. The Aga Khan hailed the volume of humanitarian and charitable aid provided by the UAE for needy areas and poor people in different parts of the world, and particularly Asia and Africa. He expressed his heartfelt thanks to Shaikh Mohammad for the tolerance and equality shown for the Ismaili community, as well as other sects and different segments of the UAE community. Upon his arrival, the Aga Khan was received by Shaikh Nahyan Bin Mubarak Al Nahyan, Minister of Tolerance, and Reem Ebrahim Al Hashemi, Minister of State for International Cooperation. 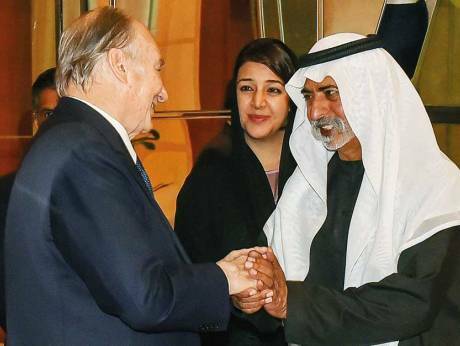 The Aga Khan’s visit to the UAE is part of a series of visits taking place globally in commemoration of 60 years of his Imamat as the spiritual leader of the Shia Ismaili Muslim community. The Aga Khan, 80, acceded to the Ismaili Imamat on July 11, 1957, succeeding his grandfather, Sir Sultan Mohammad Shah Aga Khan, according to a statement released by the Aga Khan Development Network. He completed 60 years last year as a spiritual leader of around 15 million Ismaili Muslims scattered around the world. Over the last 60 years, the Aga Khan has been deeply engaged with cultural, economic and social development efforts to improve the quality of life for people in countries around the world through the work of the Aga Khan Development Network, which today serves millions of people in over 35 countries. He has been a strong advocate for an improved understanding of Islam and for fostering brotherhood within the Ummah, as well as dialogue and cooperation among faith communities through the advancement of education, music and culture. The Aga Khan Museum, one of the first museums of Islamic art in North America located in Toronto, Canada, helps deepen understanding and knowledge exchange between cultures and faiths. Shaikh Nahyan is the honorary chairman of the Gulf and South Asia Patrons Circle of the Aga Khan Museum. Over the past 60 years, the Aga Khan has emphasised the enhancement of knowledge and understanding of the pluralism of civilisations, cultures, values and ethics around the world by establishing institutions such as the Global Centre for Pluralism. In 1977, the Aga Khan established the $1-million Aga Khan Award for Architecture awarded every three years to projects that are judged to set new standards of excellence while addressing the needs of communities in which Muslims or Islamic heritage have a significant presence. Its 13th cycle was held in Al Ain in 2016. Last year, under the mentorship of the Aga Khan Award for Architecture, a new education initiative, the Young Architects and Design Programme was established in partnership with Alserkal Avenue. While in the UAE, the Aga Khan is scheduled to meet with government leaders to discuss further cooperation in areas of mutual interest as well as members of the Ismaili community. 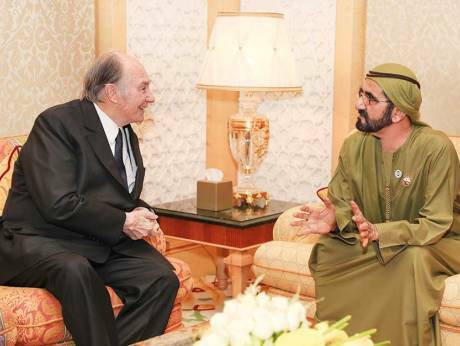 The Aga Khan, the 49th hereditary Imam (spiritual leader) of the Shia Ismaili Muslims is paying an official visit to the United Arab Emirates at the invitation of His Highness Shaikh Mohammad Bin Rashid Al Maktoum, Vice-President and Prime Minister of the UAE and Ruler of Dubai. The Aga Khan is the founder and chairman of the Aga Khan Development Network (AKDN), one of the world’s most comprehensive development organisations. Grounded in the social conscience of Islam, the responsibility to care for the needy and to uphold human dignity, the AKDN has helped improve the lives of hundreds of millions of people of all faiths and origins. 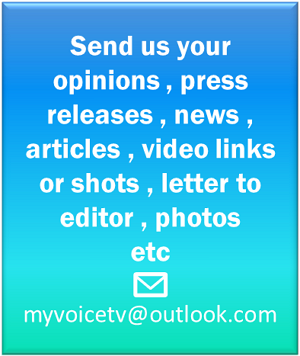 The network is present in over 30 countries across South Asia, Central Asia, the Middle East, Africa, Europe and North America. It works in close partnership with governments, public and private institutions, international organisations, foundations, and universities. The Ismaili Centre Dubai, inaugurated in 2008, was established on land gifted by the ruling family of Dubai and presented by Shaikh Mohammad to the Aga Khan in 1982 on the occasion of the Silver Jubilee of his accession to the Imamat. The Centre was awarded the prestigious Shaikh Mohammad Bin Rashid Al Maktoum Patrons of the Arts Award for its contribution to the development of Dubai’s cultural sector in 2010. Since its opening, it has actively pursued a mandate to enhance intellectual and cultural engagement and reflection and to build bridges of friendship, unity and understanding. The Ismaili Centre is also home to the Aga Khan Early Learning Centre which offers holistic early childhood education at the highest standards, on a non-denominational basis, for children aged one to four years in both Arabic and English to support their appreciation of local culture while preparing them for participation in wider society.